 Competence and commitment to excellence.  Teamwork - building strong, long-term partnerships with our suppliers and customers (internal and external).  Integrity - commitment to and acting with high ethical standards.  Compliance within required standards.  Continuous improvement - sustaining an environment that fosters the elimination of waste and variation in process.  Commitment to our community.  Accountability and ownership - taking responsibility for one's actions and an active role in career development. Program, operate, and maintain the set-ups of conventional and CNC machines and tools. Perform a variety of machining operations and modify / write CNC programs when required. Responsible for providing [U][/U][B][/B][COLOR="#0000CD"]MasterCam[/COLOR] programming and machining support for Emergent Operations processes.  Set-up, operate machines to meet all process and drawing specifications. 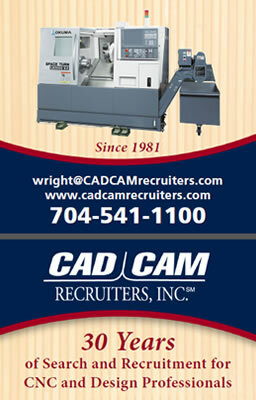  Select proper tooling, fixtures and gages per process and tooling sheets.  Write and prove out CNC programs when required (G-Code).  Troubleshoot and diagnose processes to eliminate variability.  Perform minor repairs of equipment. Assist maintenance personnel when required.  Keep work area clean and free from safety hazards.  Maintain an acceptable quality and efficiency level.  Perform other duties as required.  Understanding GD&T and its application to part inspection.  Ability to set-up and operate assigned machine tools.  Ability to interpret/inspect parts to blueprint, process sheets and Model specifications.  CPO (Certified Process Owner) certification attained and maintained. o Performs with minimal supervision. o Seeks solutions to resolve unexpected problems. o Applies essential skills in performance of job responsibilities. o Produces required volume of work. o Performs job responsibilities in an accurate and complete manner. o Complies with all applicable quality standards. o Produces high quality work.  Associates in Science degree preferred; high school diploma with equivalent experience acceptable.  Technical machine shop classes or equivalent machine shop experience relevant to position responsibilities.